Tim Pickens is the team leader for the Rocket City Space Pioneers. Tim on the Mission of the Rocket City Space Pioneers. Rocket City Space Pioneers lander and rover – artist’s conception. The mission of the Rocket City Space Pioneers team, made up of Huntsville team members Dynetics (team leader), Teledyne Brown Engineering, Andrews Space, Spaceflight Services, Draper Laboratory, Moog, Pratt & Whitney Rocketdyne, the University of Alabama in Huntsville, the Von Braun Center for Science & Innovation (VCSI) and the Huntsville Center for Technology (HCT), is to win the Google Lunar X PRIZE. 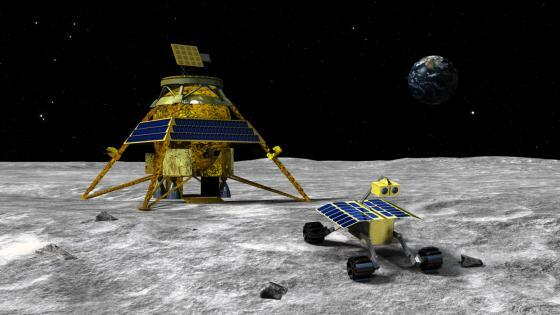 This is a $30 million international competition to safely land a robot on the surface of the Moon, travel 500 meters over the lunar surface, and send images and data back to the Earth.